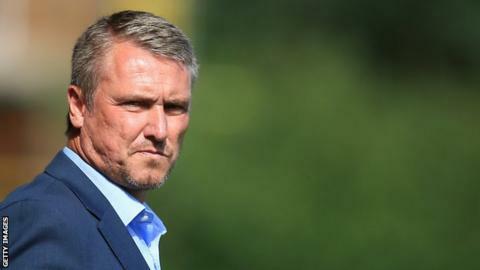 Bury boss Lee Clark says everyone in his side must bear the responsibility of Tuesday's 3-2 defeat away at Fleetwood Town. The loss was the Shakers' fifth in League One so far this season and it saw them slip to 22nd in the table. Clark's side are without a win in all competitions since the opening day of the season when they beat Walsall. "It's another game we're contemplating the reasons we've lost and how to stop it," he told BBC Radio Manchester. "Everyone has to take responsibility. You've seen the team at the end, I've gone for the jugular, I've gone for all out attack thinking we'd dominate the ball and possession." Jermaine Beckford missed a penalty in injury time which could have given Bury a much-needed point. "We keep fighting and working. We work hard every day. We show respect for each other, we fight for each other. It's easy to point fingers at one another. We all win together, we all lose together," Clark continued. "There are too many losses at the moment and you see the real men now, the men who are sticking their chest out and ready to fight, and you see the ones who are not ready for the battle and cower away. "I don't think there are any of them, I think the dressing room is full of good characters and people who are really caring and hurting at this moment in time."